Young children are natural artists. Just give any child a piece of paper and some coloured crayons, and you'll see their faces light up as they spontaneously produce a creative work of vibrance and originality. While children are quite happy to paint and draw at home, sometimes it's also nice to take them to special art classes or creative activities held in the wider community. In this way they can experiment with techniques they may otherwise not have access to, such as pottery, sculpture, textile art, papercraft and mosaics. Although there are many children's art classes held throughout Melbourne, sometimes it's hard to know which ones to pursue without a recommendation. 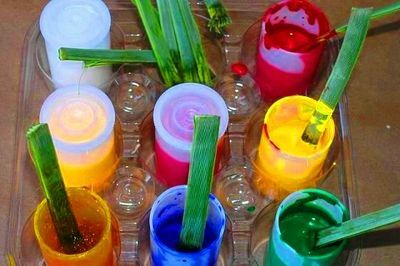 In your opinion, what are Melbourne's best children's arts and crafts classes? Which ones are free or inexpensive, and which are more pricey? What techniques did they teach and did your children enjoy them? How often are classes held? Do they have a school holiday program? ( http://www.treesparrowtreasures.blogspot.com.au/ ) has jewellery-making workshops and the Australian Tapestry Workshop in South Melbourne ( http://www.austapestry.com.au/whats-on/classes-workshops ) has weaving and tapestry-making classes. None of these are free but they're great and worth every cent you spend. For more affordable creative classes, check out your local art galleries, museums and public libraries. Workshops held at these places are often, but not always, totally free. Shopping centres often also hold free art classes to attract customers to their stores. Check their websites regularly to see what's on. Classes at ArtPlay behind fed square. NGV Kids also has a great art class program. Bunnings holds regular children's craft workshops which are free (and you can check these out on the website and register online as well). What are Melbourne's best dance classes for children? What's the best family resort in Bali?